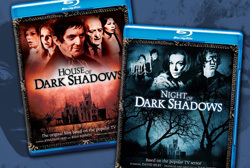 Dark Shadows News Page: Win Dark Shadows Movie Blu-Rays! Both original Dark Shadows feature films have just been released on Blu-Ray and, courtesy of our friends at Warner Home Entertainment, we have two sets of both to give away. What was the name of the Tarrytown mansion used for Collinwood in both films? Send your answer, along with your name and postal address, to webmaster@collinwood.net by November 12. Readers can order House of Dark Shadows on Blu-Ray online by clicking here and Night of Dark Shadows on Blu-Ray by clicking here. what is the status of the night of dark shadows restoration? is it complete? any chance it will be released on dvd? Maybe, if Warner Bros sees a profit in it, then they might give the restoration the green light, especially seen a lot of work has already been done saving them some trouble and expense. I hope they will go forward with the restoration. Missed out on this one..'think I know the answer it starts with a "L". Wish all the best to the winner of these Classic DARK SHADOWS films: House of Dark Shadows and Night of Dark Shadows that we bought in the newly DVD format when released in Oct. 2013, this year. There a treasure, also the new Dark Shadows movie!! Happy Holidays/Thanksgiving and Merry Christmas. I wish that the DARK SHADOWS Cast could of done the "Christmas Carol" story that Creator/Writer Dan Curtis had planned for them...'oh, well maybe an audio one should be considered!?! Thank about it.